Want to be hired by PAWSitive? Are you the type of person who would rather spend time with your pets than with your co-workers? Do you find yourself having full blown conversations with your dog or cat? Would you love to spend time with animals and get paid for it? 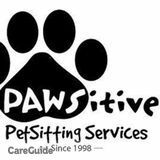 PAWSitive Petsitting Services has pet care opportunities and is looking for dependable, honest, go-getters who love caring for animals. Pet sitting services include Dog Walking, feeding, playtime, cleanup, and overnight stays (based on availability). Training is provided. You must be at least 21 years of age, live in one of our service areas, have flexible hours, and must be available weekdays, some weeknights, some weekends, and most holidays. Prior experience caring for pets. Reliable transportation and clean driving record with insurance coverage. Have no criminal record and agree to an extensive criminal background check. Daily access to a computer or smart phone with the internet and an email address. Willing to work in one of our service areas.